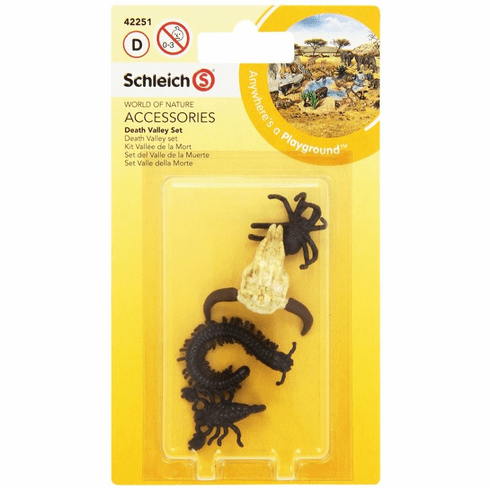 Schleich - Death Valley Set. Death Valley is one of the driest and most hostile environments on Earth. Nevertheless, there are many different kinds of animals there, which often only leave their hiding places at night because of the merciless heat. Many of these animals are not the kind you would really like to encounter as a visitor, especially venomous scorpions, spiders and centipedes. Anyone who takes off their shoes at night to sleep should shake them thoroughly next morning. Just to make sure that one of these poisonous animals has not occupied a shoe as its new burrow.